Ask a Korean! : What is Gujeong? The Korean already explained Korea's traditions surrounding Lunar New Year in this post. But this question is about the name by which Koreans call Lunar New Year -- gujeong. Why is this word interesting? Because the word means "old new year." Then what is the "new new year"? Why is there an "old new year" and "new new year" in the first place? Answer: Japan. Traditionally, Korea has celebrated the Lunar New Year. But Japan celebrated the solar new year by 1910, when it annexed Korea. After the annexation, Japan imposed the "new new year" -- what is now referred to as shinjeong. (By now, you might have guessed that gu means "old," shin means "new" and jeong means "new year.") After the liberation, majority of Koreans went back to celebrating the "old new year," although some number of families remained celebrating the "new new year." Again, happy new year to everyone! 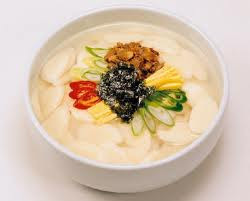 Here is a nice bowl of tteokguk (rice cake soup) for the occasion. If you want to impress a Vietnamese, mentioning your knowledge of that fact is the way to go in the next few days! Hah, I knew you would answer this eventually.. That IS a fascinating explanation, thanks for enlightening us..
You can hear too often "the chinese new year", so that's good to know that it's not only chinese but also korean, Vietnamese and so on! PS: that soup looks yummy yummy!! Lunar New Year comes from China (as does a huge chunk of East Asian culture). Calling it Chinese New Year is very accurate, despite the nationalist complaints of some people. Do you celebrate "New Year" or "Julian New Year"? Yeah it is actually Year of the cat for the Vietnamese. It's the one year that we differ. When I lived in China, everyone called it "Spring Festival" rather than "New Year" of any sort. I wonder where the term "Chinese New Year" even came from...? Thanks, The Korean! And Happy New Year! I presume he celebrates the Gregorian New Year, but I could be wrong. Muslims also have a Lunar New Year. Considering East Asian lunar years are not even lunar to begin with (they're lunisolar), using the blanket term 'lunar new year' is inaccurate. We could just follow Korea's lead on that other naming dispute and call it Chinese New Year (East, Central and Southeast Asian Lunisolar New Year Event). A handy acronym would be ECSALNE. 여러분 행복한 에크살니 되기를 바랍니다. There are several lunar calendars, including the Jewish and the Islamic calendars. The Korean lunisolar calendar is the Chinese calendar. During the Choseon dynasty, it was even calculated based on Beijing local time, not Seoul local time. Every year Korea sent an envoy to Beijing to pick up the calender for the next year, as only Chinese court mathematicians were allowed to do calendar calculations. Well it's Chinese New Year actually, because It's based on Traditional Chinese Calendar. It would be the same as calling Roman Alphabet as English or Italian Alphabet just because other country use it.